Yellowstone is home to two populations of bear species -- black bears, which are fairly common, and their rarer cousins, grizzlies. According to recent estimates, there are some 300 to 600 grizzlies within the park. 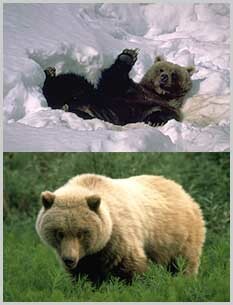 There are clear physical and behavioral differences between black bears and grizzly bears. Black bears are primarily adapted to use forested areas and their edges and clearings. Although grizzly bears make substantial use of forested areas, they also make much more use of large, non-forested meadows and valleys than do black bears. Black bears have short, curved claws better suited to climbing trees than digging. This enables black bears to forage for certain foods, such as mast, by climbing trees. In contrast, grizzly bears have longer, less curved claws and a larger shoulder muscle mass better suited to digging than climbing. This enables grizzly bears to efficiently forage for foods which must be dug from the soil such as roots, bulbs, corms, and tubers, as well as rodents and their caches. Did you know? Another behavioral difference between black bears and grizzly bears is the length of time cubs are under their mother's care. Black bear cubs are born in the winter den, spend the summer following birth with their mother, den with her again in the fall, then separate from her early the next summer as yearlings. Grizzly bear cubs spend two and one-half and sometimes three and one-half years under their mother's care before separation. Color: Varies from pure black to brown, cinnamon, or blonde; in the Rocky Mountains, approximately 50 percent are black with a light brown muzzle. Color: Varies from black to blonde; frequently with white-tipped fur giving a grizzled, "silver-tipped" appearance. In the Yellowstone ecosystem, many grizzly bears have a light brown girth band. Height: About 3-ft. (0.9 m.) at the shoulder. Height: About 3.5 ft. (1.0 m) at the shoulder. Life Expectancy: 15 to 20 years in the wild, 30 plus years in captivity. Life Expectancy: 15 to 20 years in the wild, 30 plus years in captivity. Yellowstone's coyotes are among the largest coyotes in the United States; adults average about 30 lbs. and some weigh around 40 lbs. This canid (member of the dog family) stands less than two feet tall and varies in color from gray to tan with sometimes a reddish tint to its coat. Coyotes live an average of about six years, although one Yellowstone coyote lived to be more than 13 before she was killed and eaten by a cougar. A coyote's ears and nose appear long and pointed, especially in relation to the size of its head. It can generally be distinguished from its much larger relative, the gray wolf, by its overall slight appearance compared to the massive 75 to 125-pound stockiness of the bigger dog. The coyote is a common predator in the park, often seen alone or in packs, traveling through the park's wide-open valleys hunting small mammals. But they are widely distributed and their sign can also be found in the forests and thermal areas throughout Yellowstone. They are capable of killing large prey, especially when they cooperatively hunt. Did you know? Beginning in 1988, park staff increased monitoring of coyotes along park roadsides, experimenting with scaring unwary coyotes from visitor use areas with cracker shell rounds, bear repellent spray, or other negative stimuli, but there is little indication that such techniques caused long-term changes in individual coyote behavior. 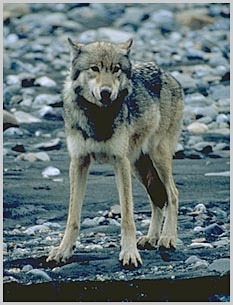 Gray wolves were native to Yellowstone when the park was established in 1872. Predator control was practiced here in the late 1800s and early 1900s. Between 1914 and 1926, at least 136 wolves were killed in the park; by the 1940s, wolf packs were rarely reported. By the 1970s, scientists found no evidence of a wolf population in Yellowstone; wolves persisted in the lower 48 states only in northern Minnesota and on Isle Royale in Michigan. An occasional wolf likely wandered into the Yellowstone area; however, no verifiable evidence of a breeding pair of wolves existed through the mid-1990s. In the early 1980s, wolves began to reestablish themselves near Glacier National Park in northern Montana; an estimated 75 wolves inhabited Montana in 1996. At the same time, wolf reports were increasing in central and north-central Idaho, and wolves were occasionally reported in the state of Washington. The wolf is listed as "endangered" throughout its historic range in the lower 48 states except in Minnesota, where it is "threatened." An estimated 20,000 park visitors have observed wolves since their return in 1995. The program's visibility has resulted in opportunities to educate audiences about predator-prey relationships, endangered species restoration, and the importance of maintaining intact ecosystem. For both Idaho and Yellowstone, wolf population recovery is defined as having about 100 wolves, or approximately 10 breeding pairs, established in each area for three successive years. Did you know? The goal to restore wolves and begin delisting them by approximately 2002 appears within reach. The return of the only species known to be missing from the world's first national park for the past half-century has been a milestone in ecological restoration. It has not only restored the wildlife complement of greater Yellowstone; it has been a symbolic victory for conservationists who patiently and persistently reversed the once-dominant attitude against predators to one of acceptance. Elk are the most abundant large mammal found in Yellowstone; paleontological evidence confirms their continuous presence for at least 1,000 years. Yellowstone National Park was established in 1872, when market hunting of all large grazing animals was rampant. Not until after 1886, when the U.S. Army was called in to protect the park and wildlife slaughter was brought under control, did the large animals increase in number. More than 30,000 elk from seven to eight different herds summer in Yellowstone, and approximately 15,000 to 22,000 winter in the park. The subspecies of elk that lives here are found from Arizona to northern Canada along the Rocky Mountain chain; other species of elk were historically distributed from coast to coast, but disappeared from the eastern United States in the early 1800s. Some other subspecies of elk still occupy coastal regions of California, Washington, and Oregon. 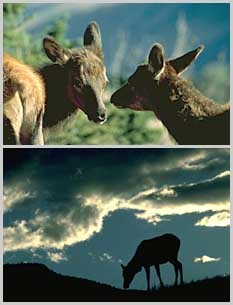 Elk are the second largest member of the deer family (moose are larger). Adult males, or bulls, range upwards of 700 pounds while females, or cows, average 500 to 525 pounds. Their coats are reddish brown with heavy, darker-colored manes and a distinct yellowish rump patch. Did you know? Bulls grow antlers annually from the time they are nearly one year old. When mature, a bull's "rack" may have six to eight points, or tines, on each side and weigh more than 30 pounds. The antlers are usually shed in March or April, and begin re-growing in May, when the bony growth is nourished by blood vessels and covered by furry-looking "velvet." Antler growth ceases each year by August, when the velvet dries up and bulls begin to scrape it off by rubbing against trees, in preparation for the autumn mating season or rut. A bull may gather 20 to 30 cows into his harem during the mating season, often clashing or locking antlers with another mature male for the privilege of dominating the herd group. By November, mating season ends and elk generally move to their winter ranges. Calves weighing 25 to 40 pounds are born in late May or early June. Bison are the largest mammals in Yellowstone National Park. They are strictly vegetarian, a grazer of grasslands and sedges in the meadows, the foothills, and even the high-elevation, forested plateaus of Yellowstone. Bison males, called bulls, can weigh upwards of 1,800 pounds. Females (cows) average about 1,000 pounds. Both stand approximately six feet tall at the shoulder, and can move with surprising speed to defend their young or when approached too closely by people. Bison breed from mid-July to mid-August, and bear one calf in April and May. 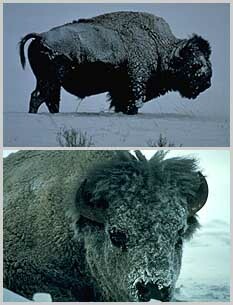 Some wolf predation of bison has been documented in Canada, and recently observed in Yellowstone. Bison are nomadic grazers, wandering high on Yellowstone's grassy plateaus in summer. Despite their slow gait, bison are surprisingly fast for animals that weigh more than half a ton. In winter, they use their large heads like a plow to push aside snow and find winter food. 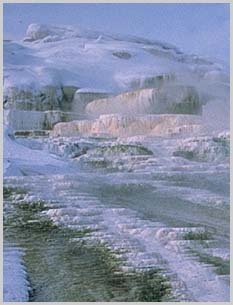 In the park interior where snows are deep, they winter in thermally influenced areas and around the geyser basins. Bison also move to winter range in the northern part of Yellowstone. Did you know? Half of Yellowstone's bison have been exposed to brucellosis, a bacterial disease that came to this continent with European cattle and may cause cattle to miscarry. The disease has little effect on park bison and has never been transmitted from wild bison to a visitor or to domestic livestock. Despite the very low risk to humans and livestock today, since the possibility of contagion exists, the State of Montana believes its "brucellosis-free" status may be jeopardized if bison are in proximity to cattle. Although the risk is very low, if cattle become infected, ranchers can be prevented from shipping livestock out of state until stringent testing and quarantine requirements are met. Although scientists are studying new possibilities, there is yet no known safe, effective brucellosis vaccine for bison. Ironically, elk in the ecosystem also carry the disease, but this popular game species is not considered a threat to livestock.